Please, don't touch the screen. : Braking, HSD style. Here is a long brake on a straight road, right before a traffic light. At 5:02:22, at a speed of 57 km/h, I began applying pressure on the brake pedal. I applied the same pressure throughout the whole maneuver. 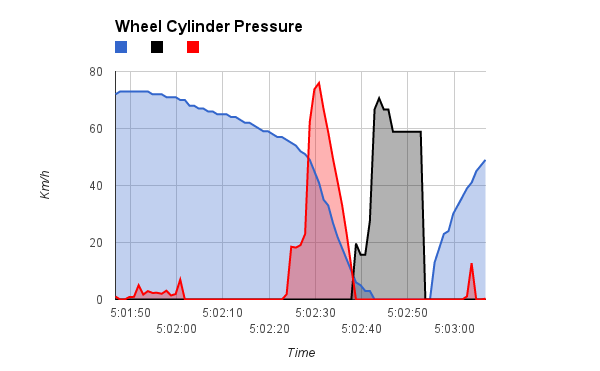 As soon as began braking, some current started flowing to the battery as the charging effect of the speed loss. Current topped at 75A at 41 km/h. At 5:02:37, as soon as speed lowered to 10 km/h, hydraulic braking kicked in.